As a leading real-estate development and property management company in California, Tutelian has been the cornerstone of growth and expansion in Fresno for over 50 years. The company is now synonymous with beautiful high-quality developments, and has built some of the finest buildings in the city. Although primarily involved in new projects, we are also passionate about the detailed and loving preservation of historic buildings such as The Grand 1401, where our headquarters are now currently located. The list below gives a small glimpse of all our previous work, including large developments and building restorations throughout Fresno. The 2440 Tulare Street office built by Tutelian, is Downtown Fresno's signature Class ‘A’ 4-Story Office building. This attractive and well design building offers 86,117 SF of professional office space, and provides tenants with 2 high-speed elevators, enhanced designer finishes, state-of-the-art data transmission facilities, and card key security system. This development also has the unique feature of a secure multi-storey, ADA compliant, parking structure adjacent to the building that also creates space for retail units along N Street. This stunning asset for Downtown has allowed Tutelian to bring number of professional businesses to Downtown Fresno, while also allowing retail services to cater for the needs of the professional workforce. 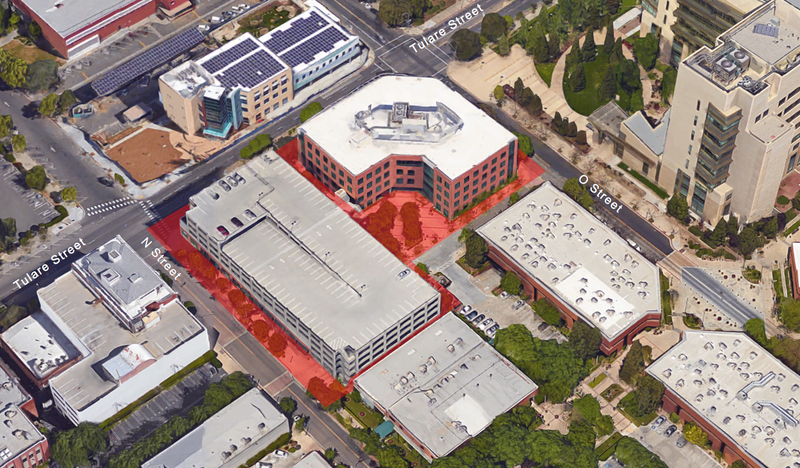 Located in what is now part of the Civic Center Square, this development has added a much needed campus-like ambience to the area, providing a highly professional and pleasant working environment in the heart of Downtown Fresno. Park Place Fresno is mixed use commercial development with 90,000 SF of retail and restaurant space, with an additional 100,000 sf. of Class A office space. The entire centre stands in a class of its own, within the Palm Bluff Corporate area and provides an upscale retreat for the local population. Built in 2008 the centre is anchored by the GB3 gym, Eureka! Burger, and Daily Grill. The site also boasts an exclusive Private Preschool - Bluff View. The convenient location at N. Palm and Nees means over 55,000 cars pass the site daily, and up to 78,400 people live within a 3 mile radius. Park Place Fresno is at the heart of the upscale Northern Fresno community, and is nestled amongst some of the most prestigious zip codes in the city. With the nearby River Park Shopping area, the Park Place development is an integral part of the North Fresno community. Tutelian purchased the iconic Grand Tower in 2005 in order to preserve and maintain a much loved landmark within Downtown Fresno. 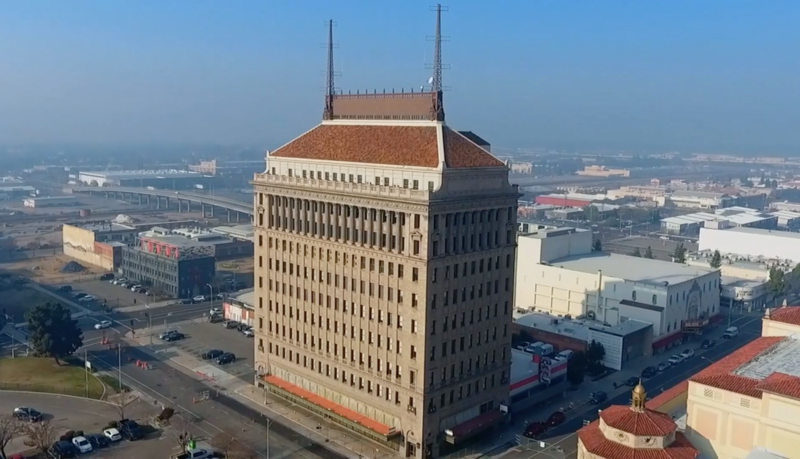 Originally built in 1924 by the San Joaquin Power Company, The Grand Tower is a highly significant building in Fresno, both as a visual architectural landmark for the City and as an excellent example of the Italian Renaissance Revival style. Since its purchase, Tutelian has utilized a wealth of experience and knowledge to lovingly restore the entire building. The Grand Tower now boasts two gorgeous, and fully restored ballrooms, plus over 80,000 SF of Class A office space. Tutelian's dedication to the revival of Downtown Fresno has guaranteed the survival of a building on the National Register of Historic Places, while also bring a businesses and people to the area. Tutelian developed the 22 acre site on the corner of Blackstone and Nees in 2002, creating an attractive and well designed retail shopping center offering 176,573 SF of rentable space. In doing so Tutelian brought a number of large retail outlets to Fresno for the first time - including Nordstrom Rack. 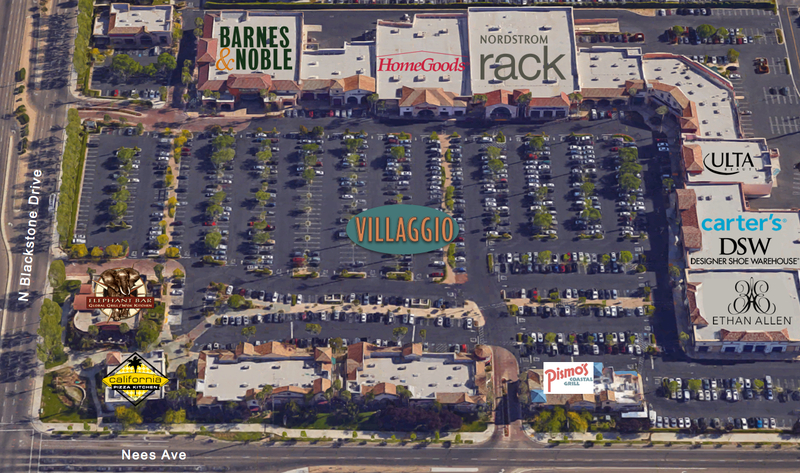 Villaggio Shopping Center is now anchored by category leaders Nordstrom Rack, Home Goods, and Barnes & Noble, and is now a crucial part of Northern Fresno's retail sector offering a wide array of popular tenants within an inviting setting that draws multiple weekly customer visits. Villaggio Shopping Center is well positioned at the southwest corner of Blackstone Avenue and Nees Avenue in the northeast section of Fresno, the sixth largest city in California, and the financial and cultural capital of the Central Valley, a top 100 fastest growing U.S. city.